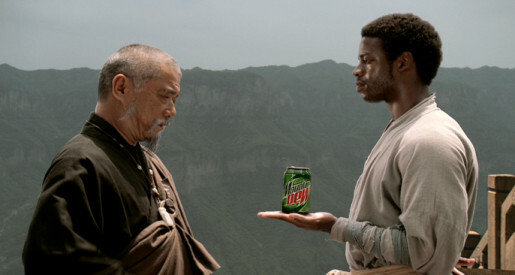 Mountain Dew becomes the focus of ‘Master’ a 2006 television advertisement featuring a trainee hand slapper in the mountains of China. A young man (Breon Ansley) enters a mountainside community of novices in the martial art of handslapping. His long-term goal, through much training and hardship, is to equal the master (Dana Lee). Finally he believes he is good enough to take on the master, with a Mountain Dew in hand. But is he really that good? The video clip is available in 30 seconds, 60 seconds, and 2 minutes 30 seconds. Embedded here is the extended version. Mountain Dew ‘Master’ was created at BBDO New York, by creative directors Bill Bruce and David Lubars, Brazilian art director Cesar Finamori, copywriter Dulcidio Caldeira, agency producer Amy Wertheimer, and executive music producer Loren Parkins. Filming was directed by Swedish collective Traktor via Partizan, New York, with Yugoslav director of photography Bojan Bazelli, executive producer Richard Ulvengren and producer Jack Hardwick. The spot was filmed at Mt. Tian Gui monastery in China. The two main characters from Los Angeles joined students from a local kung fu school. Mountain Dew Master was edited by John Murray, with sound designed by Francois Blaignon, at Nomad, Los Angeles. Audio post production was mixed by Tom Jucarone at Sound Lounge, New York. Music was composed by Jeehun Hwang at Groove Addicts, Los Angeles, and performed by the LA Orchestra, an all-male chorus and players of traditional Chinese instruments.